The Freescale 9S12XS microcontroller is a low-cost, stripped-down version of the S12XE, omitting the XGATE co-processor, Memory Protection Unit, and Emulated EEPROM. It features the high-performance CPU12X core, operating at up to 40 MHz, additional addressing modes, and fast 16-channel high-resolution analog-to-digital converter subsystem (12-bit resolution and 3us conversion time). The MC9S12XS has full 16-bit data paths throughout. Adapt9S12XS joins the "Adapt" Modular Prototyping System (AMPS) pioneered by Technological Arts. 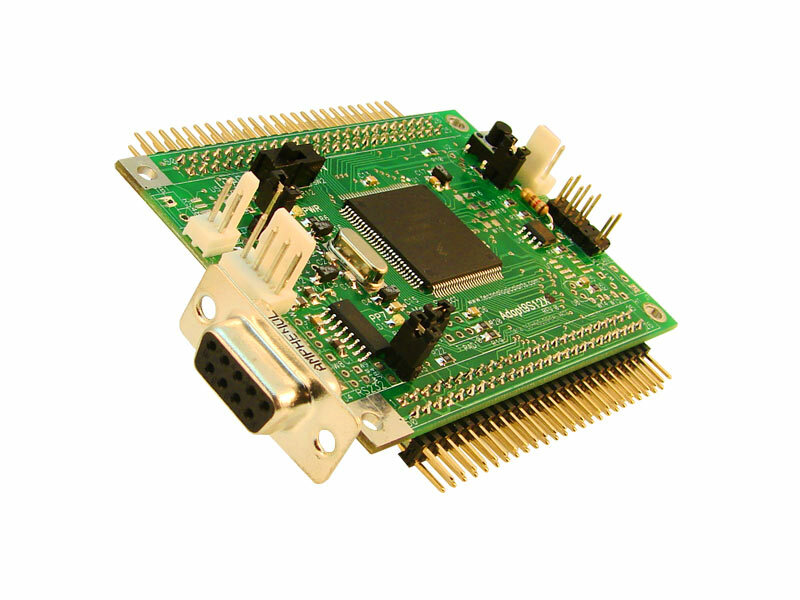 Unlike conventional evaluation and demo boards offered by other vendors, the flexible design of this system addresses the varied requirements of evaluation, training, product development, proof-of-concept prototyping, and even volume production. The following list summarizes the differences between the S12XS family and the S12 family. Implemented in an "AdaptS12" form factor board, Adapt9S12XS256 is compatible with an entire range of application cards, prototyping cards, and backplanes, and usable with solderless breadboards ("proto boards"). The module includes all necessary support circuitry for the MCU, as well as a 5-Volt regulator, dual RS232 transceivers, and one CAN transceiver on-board. If you require mating connectors, browse Connectors in the Components category at the left. For power supplies, browse the Accessories category. All of our standard connector options are available for this board. The product photo above shows "RA1" connector on both H1 and H2. Please make your choice of connectors before adding this item to your shopping cart. Otherwise, the board will be shipped with the default option (i.e. no connectors on H1 and H2). We can customize this module to suit your needs (e.g. different crystal/oscillator, different MCU variant, selectively populated communications transceivers, etc.). Please contact us for a quote on quantity of 25+ units.